Christmas is just around the corner, but here’s a little news from November and early December. We’ll publish a Christmas journal entry sometime after the New Year. We hope you and your loved ones enjoyed a lovely day of thanks-giving on Nov 23. 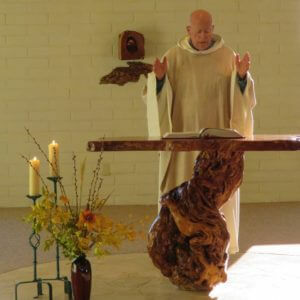 Here are a few photos from our own celebration: Fr. Jim at the altar during Mass, Sisters receiving communion, and everyone helping in the kitchen afterward. We shared our Thanksgiving dinner with Fr. Jim, our chaplain, and our Benedictine brothers from neighboring Erlac Monastery. 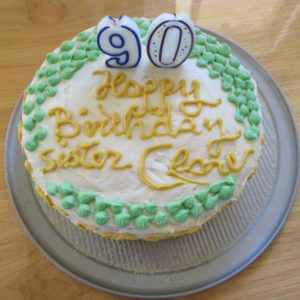 Our Sr. Clare became a nonagenarian on Nov 27! She is the first of us to reach this august age, and we are all hoping that we will be as bright-eyed and sharp-witted as she is, if we get to the age 90. 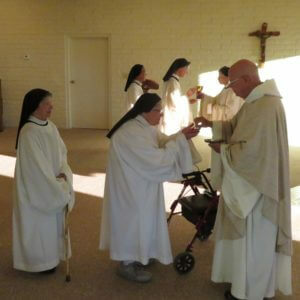 Sr. Clare began celebrating earlier in the month when her two sisters, Ann and Maureen, brother, Joe, and sister-in-law, Marylou, arrived for a visit. 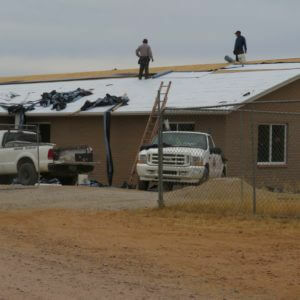 They had a grand time together at the old Family Guest House. On Clare’s birthday itself we Sisters celebrated with a nice dinner together. 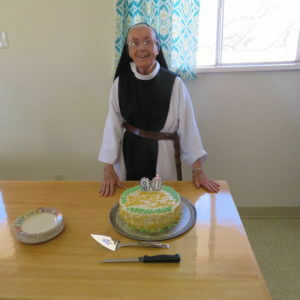 Here is Sr. Clare with her birthday cake, kindly made by our friend Monika for this very special occasion. 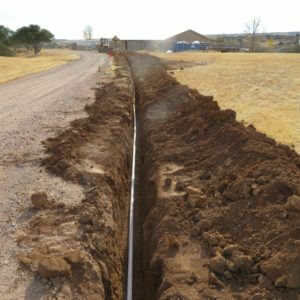 Since our last journal entry, plumbers, electricians, HVAC specialists, insulators, and excavators have all been busy. The excavator, Thomas, deserves special mention: he carefully dug the two new leach field lines so as to preserve the trees in the way, and dug both lines perfectly parallel, in lovely gentle curves around the trees. 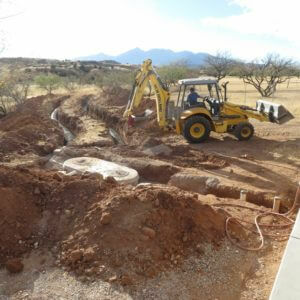 We’d never seen anything quite like it–artistry with a backhoe! 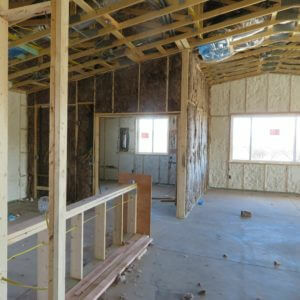 Next in line are the drywall installers who are getting started as we post this (mid-December). 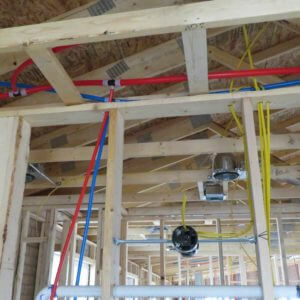 Photos from left to right, top row, then bottom row: Sr. Kate standing at the breakfast bar in the new Family Guest House; the roofing crew standing on the heights; red & blue water lines and yellow electric cables make a colorful interior; Thomas at work on the septic system; insulating foam was sprayed on the interior of all the exterior walls, and thick brown batting installed in interior walls; replacing the brittle, old water line between the monastery and the guest house. 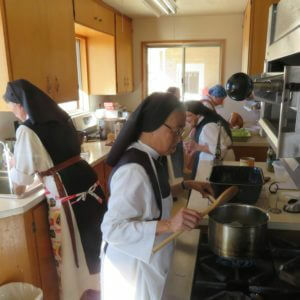 We’ve been extra busy at Cistercian Altar Breads in recent weeks–mixing, baking, cutting, sorting, bagging, and shipping our whole wheat altar breads to parishes all across the U.S.A. Altar breads are not exactly the thing to buy as a Christmas gift, but our breads will be consecrated at hundreds of Masses on Christmas Eve and Christmas Day in order to give Jesus to thousands of people–a lovely thought! 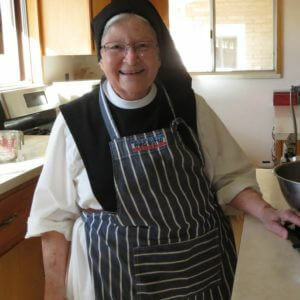 While Sister Rita is boxing up altar bread orders in the bakery, across the yard in the monastery there are delicious aromas wafting up the cloister from the monastery kitchen where Sisters Margarita (in photo), Esther and Nettie are baking for our Christmas celebration. Mother Vicki has decorated chapter room Christmas tree, but we won’t turn on the lights until the tree is blessed on Christmas Eve. Sister Esther is tending the candles of our Advent Wreath while also envisioning how she will arrange the Christmas creche at the foot of the altar. Elf Sister Clare is wrapping a few gifts for Santa to leave under our tree. 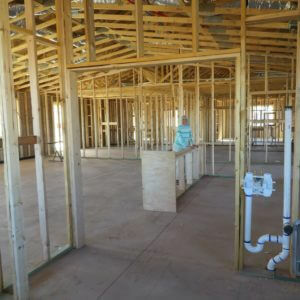 Sister Pam is wondering if there might be a simpler way to arrange the outdoor Christmas lights … Of course, the most important Christmas preparations are those we make in our hearts! Each of us is trying to get in a little extra prayer and lectio divina to fill in any inner “valleys” and level any “inner mountains or hills,” to prepare a way for our Savior. May our hearts and yours be ready for the coming of our newborn king, Jesus, our Emmanuel, God-with-us! 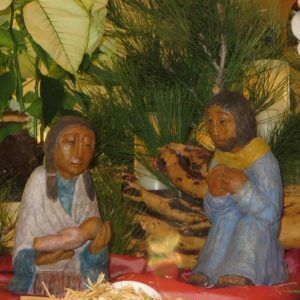 Here’s a few small Christmas gifts from Santa Rita Abbey to you. If you hover over the Journal tab above, a drop down list appears. Choose “Reflections On the Gospel” and you will find Mother Vicki’s Advent Candle Blessing talks for each Sunday of Advent. Choose the second item on the drop down list, “Christmas Newsletter,” and you’ll find our 2017 Christmas letter. We hope these will add a little extra blessing to your celebration of Advent and Christmas this year! Merry Christmas! God bless us, every one!